Cane Corso - TCane Corso Cane Corso Breeder. About the breed Cane Corso: History of Cane Corso. Originally from Italy, Cane Corso literally means "protector dog." "Cane" means dog in Italian, while the word "Corso" comes from the Latin "Cohors" which means protector. 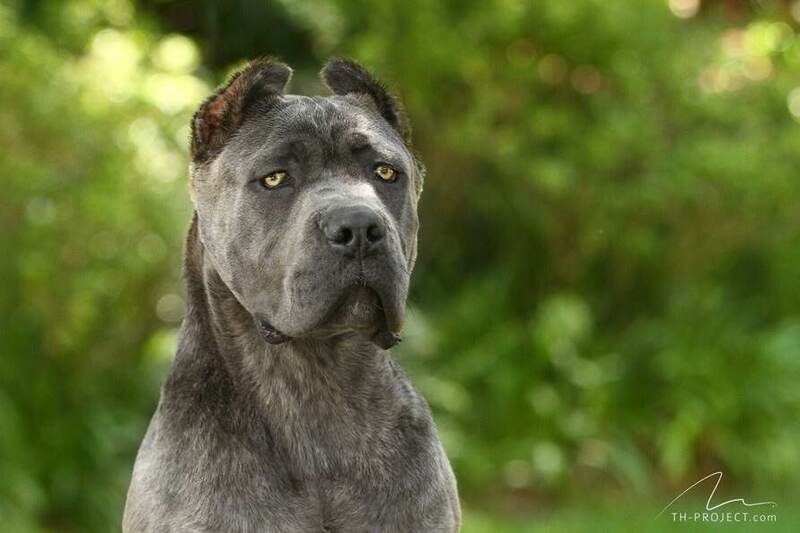 Cane Corso(like the Neapolitan Mastiff) is a descendent of the Roman war dog, Canis Pugnax. It was bred to be a guard dog for property and cattle, but also aided in the hunting of larger game when some strength and speed was needed. This is how a Molosser is different from the others. Instead of preferring to rest, this type of dog loves to constantly accompany their owners and inspect the cause of any strange noise. Those who know the breed say it is without equal for guarding and protection. This does not mean that the Cane Corso has an aggressive nature, quite the opposite; it only reacts when a true threat is present. A Cane Corso exhibits a certain indifference when approach by people it doesn’t know; it is its instinct to protect that makes it cautious. With the owner and family, the Cane Corso is a docile and affectionate animal, who loves children. While some breeds become restless with ear pulling or feel threatened when a child climbs on its back, the Cane Corso views these gestures as play and reacts in a playful manner. Nevertheless, because it is a large dog, it is important to be cautious and supervise play. The Cane Corso is a rustic, strong, athletic, energetic and territorial dog that tends to be dominant, although easily socialized. They are happy dogs who love "TO BE" with everyone and very attached to the family. Due to their size, and primarily due to their happy nature, these characteristics have to be "managed," to avoid possible "mishaps" inside the home. Their constant joy and desire to play can result in "some broken vases"... So give them the care and attention they deserve, because the dedication of a cane corso is absolutely unconditional. Another important point is to make sure to stay current with vaccinations.